Said Rear Admiral Grace Hopper of the US Navy (she is also, by the way, a truly remarkable lady and well worth looking up if you get the chance). At EBISS one thing we definitely agree with the late Rear Admiral on, is the need for accurate measurements. We are always very particular about weighing and measuring every shipment, crate, box, carton or parcel that we are transporting regardless of the freight method, this information is vital to providing you with a cost-effective delivery, improving the safety of your items and reducing the chance of any unwanted delays to your consignment. You may wonder why this matters so much if we are using our own vehicles for the transportation, but we need to know the exact weight & volume of every item in the load, for a number of reasons. 1. 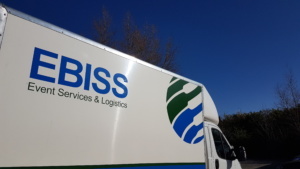 Safety – We have a duty of care to our drivers that they have accurate details relating to the goods on their delivery route – can they safely lift the item on their own or will they require any additional mechanical handling? 4. Protecting your goods – by knowing the exact sizes and weights of every item, we can ensure that they are packed in the best possible way for their protection. For example, in the case of art shipping, we would recommend securing several smaller boxes or crates onto a single pallet, as this creates a safer method of transportation for all the items by preventing movement and reducing any manual handling required plus we can ensure that every piece packed to the correct orientation (ie. the right way up) and does not have other items packed on top of or next to it which could potentially damage it in transit. 5. Improving efficiency, reducing costs – by packing the space in our vans efficiently it ensures we can offer you the best prices, which means everyone’s a winner! The best news? We do ALL these calculations automatically on your behalf – so you don’t have to! Contact our logistics experts today for a free, no obligation quote for your next shipment.